A new beginning for the Maddox series. It’s August 1944 and World War 2 is going badly for Germany. A militant group of Nazis unveils a technological marvel they believe can turn the tide – using precision targeting they can land a V2 rocket within a 20 yard by 20 yard square. Their first target: Winston Churchill himself. Captain Maddox is a seasoned veteran of Britain’s Special Operations Executive. To stop the Germans, he is ordered behind enemy lines into Northern Finland – where local resistance fighters have been battling alongside the Germans to keep the Red Army at bay. But in the murky depths of the Finnish conflict, lines are blurred between Allies and foes. 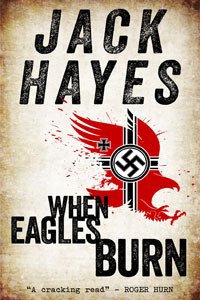 When Eagles Burn. The fourth in the Maddox series. Available from Amazon or FREE from Smashwords. "A cracking read!" - Roger Hurn.